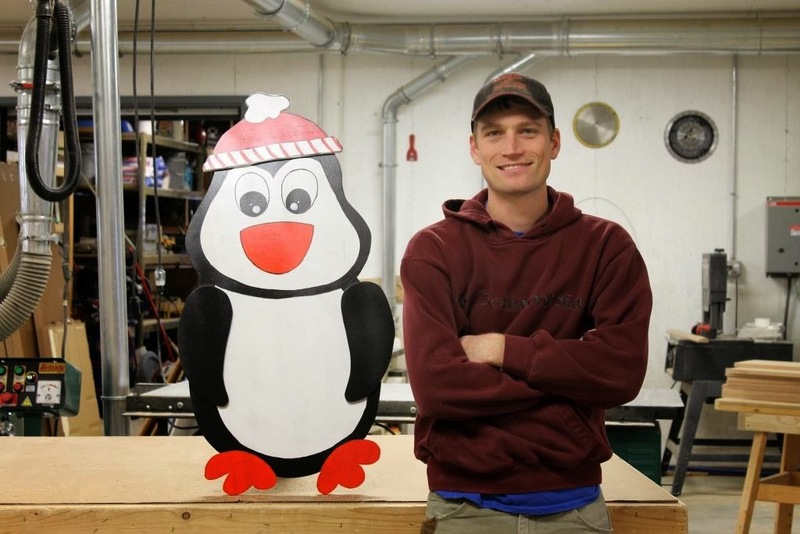 I had a recent request for a large-scale wooden penguin to decorate a front porch. At the time, the largest penguin I'd made was 18" tall - so I doubled it to create a monster stand-alone bird. I had to request a little help from my husband, Jason, and I'd say we ended up with a wintery and fun front door decoration. I'm thinking of making one for myself, too! Here's Jason posing next to the monster penguin we created so that you all can get a sense of scale. He looks rather thin from the side... a little look at the prop that's holding the penguin up, it's hinged for easy storage. Portrait of a Penguin. Here he is all alone in all his wintry glory.